Happy New Year from the Oregon Digital Newspaper Program! As of today, January 11, 2019, the ODNP website has surpassed 1 million pages online! Only a handful of statewide newspaper digitization and preservation programs have over 1 million pages and we are happy to be in their ranks. Added over 75,000 pages to the website. Partnered with 4 libraries, 1 public donor, 1 private donor, and 4 organizations for digitization projects. Received a $23,000 anonymous donation to digitize Just Out, The Advocate, and four more Portland-based titles. Featured on NDN History Research blog and Building Knowledge. Contributed to the Reveal Digital project with the digitization The Western American. Added another high school newspaper, The Amplifier. Exhibited and presented at five conferences. 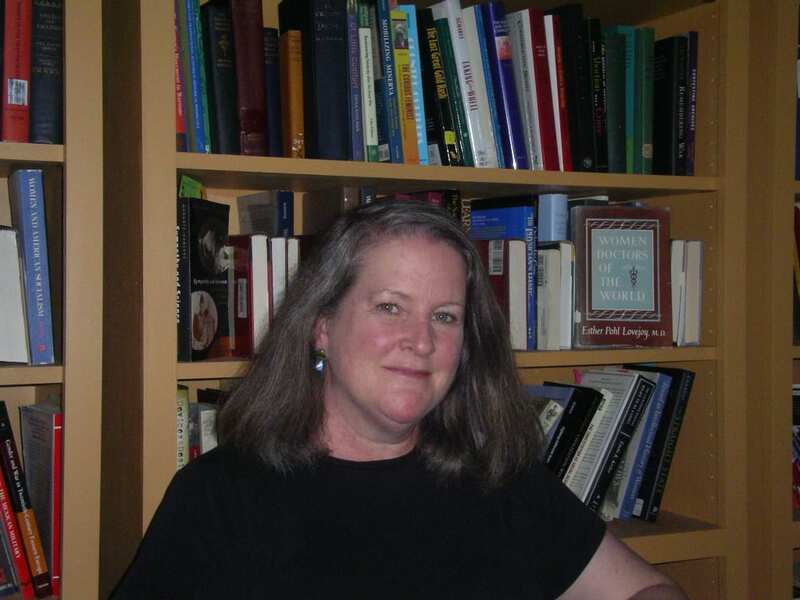 Added eight new user stories to the blog, including information about how the website was used for four authors and their publications, an undergraduate class, genealogists, and a UO graduate student’s dissertation. As always, thanks to all of our newspaper digitization enthusiasts for supporting the Program. Without outreach and advocacy, we would not know about all of the users and interesting research that is done with the website! Most importantly, thanks to the past and present ODNP team who do all of the work to digitize and preserve the newspapers, and keep the website up and running. 2019 is looking exciting. Please reach out if you want to get involved and add your local newspaper title to the website. 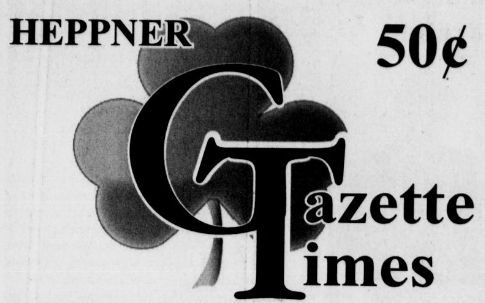 Thanks to the generosity of the Morrow County Heritage and Agricultural Museums, our website has new content for the Heppner Gazette-Times! Issues from 1987 to 2014 were recently added to our preexisting online collection of issues for this title. Since this addition coincides with the Halloween season, check out how the local community of the Heppner area has celebrated Halloween over the years. Throughout the years the small town of Heppner has celebrated Halloween in a variety of ways. Scarecrow making contests have been enjoyed by the residents of Heppner along with hunting for the homes of scarecrows. 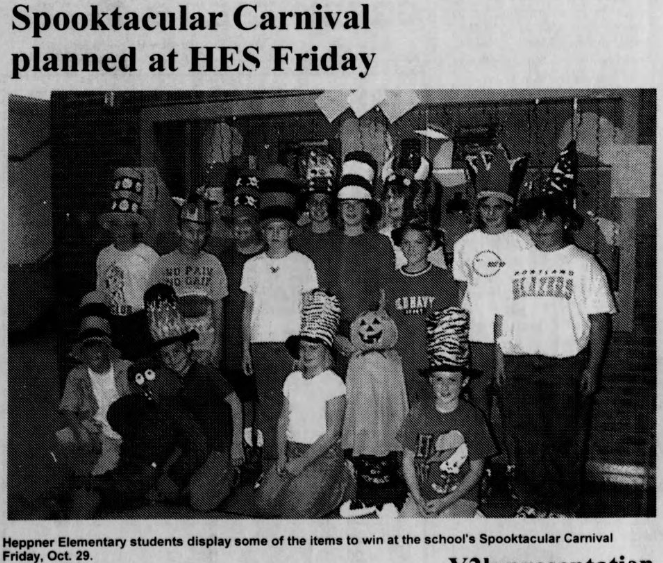 Take a look at the “spooktacular” carnival hosted by Heppner Elementary School almost twenty years ago! 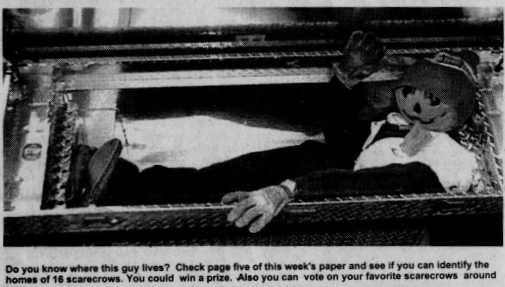 Along with scarecrows, carnivals, and pumpkin carving, Heppner also participated in other fun Halloween activities, such as guessing the weight of a gigantic pumpkin to win it. 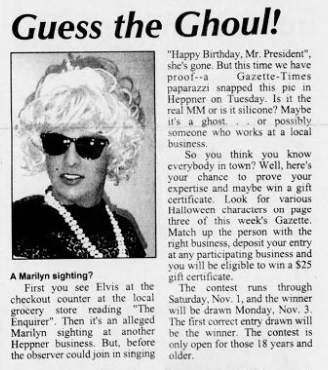 There was also a “Guess the Ghoul!” contest where pictures of employees from local businesses dressed up in costumes were displayed in the paper for the townspeople to guess which “ghoul” belonged to which business in order to be entered to win a gift certificate. The town of Heppner has been creative when it comes to decorating and dressing up for Halloween. To get a glimpse of even more spooky delights from Heppner, browse through other issues of the Heppner Gazette-Times found on our website. Thanks to optical character recognition, this title along with all other titles located on our website, can easily be browsed or searched using keywords. In addition to this, all of our content can be downloaded as a PDF or JPEG and saved for future reference or research. Hayley G. Brazier shares with us how she’s been using Historic Oregon Newspapers in her dissertation research! I am a PhD candidate in the Department of History at the University of Oregon. My primary research field is environmental history, which means I study the history of human exchanges with the environment in past times. We understand that all human history has an environmental context. I came to this field with a long-standing obsession with American history coupled with an environmentalist’s passion. 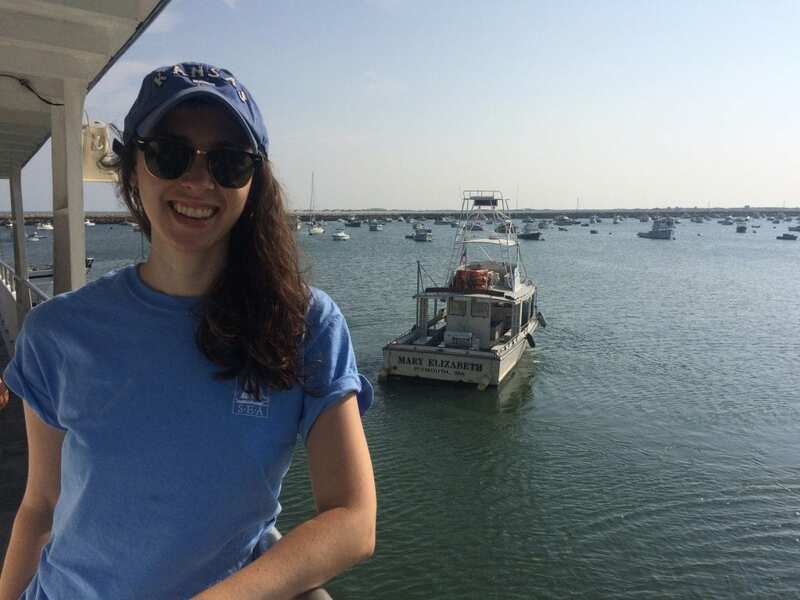 For my dissertation, I am focusing on marine environmental history, in particular, how the development of deep-sea infrastructure has influenced larger stories of politics, diplomacy, and capitalism in the nineteenth and twentieth centuries. In addition to my research, I currently work as the program coordinator for the Digital Humanities @ UO (dh.uoregon.edu), so incorporating digital research from Historic Oregon Newspapers into my dissertation is a nice marriage of both of my interests. What led you to Historic Oregon Newspapers? 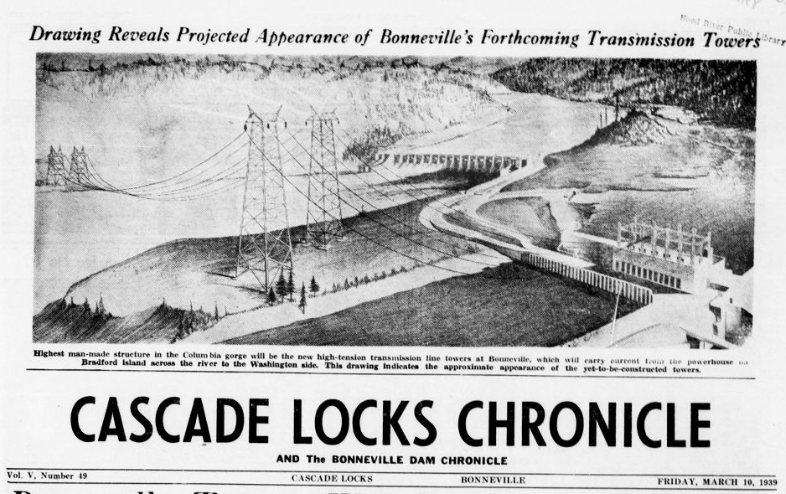 I am using Historic Oregon Newspapers to find any mention of the installation of submarine cables both in the Atlantic and the Pacific in the late nineteenth and twentieth centuries. In those results, I am first looking for articles that provide historical data on which companies landed those cables, on which dates, and in which locations. Once I have collected that data, those names and dates can guide me to additional archival collections. 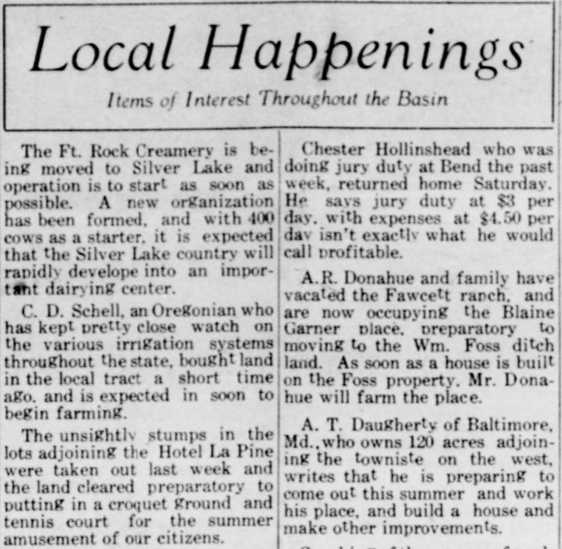 Searching historic newspapers can be a great method for getting a sense of a historical topic and an important stepping stone for further archival research. 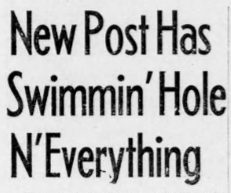 I am also using Historic Oregon Newspapers to gauge how Oregonians, and Americans in general, felt about the deep sea and submarine technologies; were they discussing it? Was it part of a common imagination, like outer space came to be in the mid-twentieth century? So, Historic Oregon Newspapers is helping me gauge a regional interest in a larger American trend. How do you perform research on Historic Oregon Newspapers? Historic Oregon Newspapers is definitely one of the better databases I have used. Other digital newspaper collections can be difficult to access, particularly if you live in a different state and they require a library card. Also, many databases charge expensive subscription fees, and that’s a real difficulty for graduate students like myself who are usually low on funds. 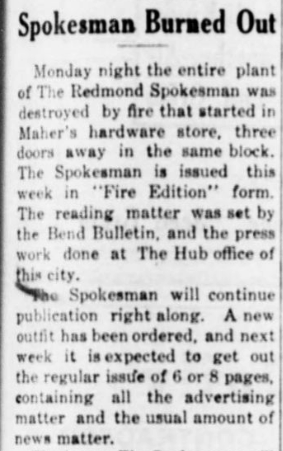 So, I really appreciate that there are no obstacles to begin researching on Historic Oregon Newspapers. I can see accurate search results within seconds of arriving to the site without logging in, submitting advanced search criteria, or choosing between various catalogues or collections. Because Historic Oregon Newspapers encompasses articles from a broad date range (1846-2017), the database results can reveal interesting trends. For example, if I search “submarine cable” and get a ton of articles from the 1910-1930s, but almost no articles for the 1880s-1900s, then those result could indicate that submarine cables were finally becoming a household topic in Oregon by the 1910s-1930s, even if the first submarine cables were created in the previous century. On Historic Oregon Newspapers, there is a keyword search function that very helpfully populates a list of pertinent articles and then highlights that word in red within the article (my goodness, what time saver!). From that list, I can choose the newspaper article that has the most highlighted keywords, which helps me narrow in on an article that will be most relevant to my research. I have found this keyword highlight function to be good at catching words even when the original document’s text has faded with age. Another helpful feature the database provides is the option to save articles as a PDF, which I use often. I can save the PDF directly to my primary source folders in Zotero. This PDF functions eliminates the needs to take screen shots of the article. Thanks to the generosity of the Dallas Public Library we have been able to add more issues from the Polk County Observer to our digitized collection! 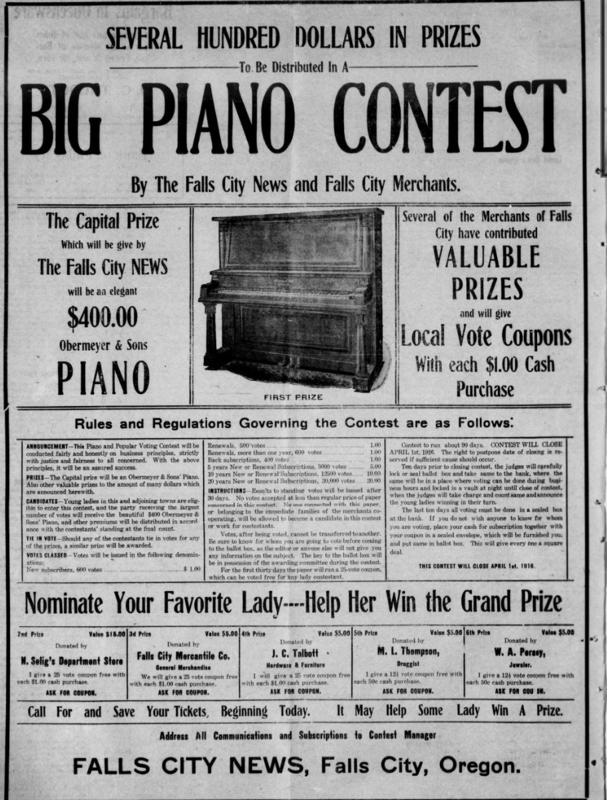 This new content ranges from April 7, 1888, when the Polk County Observer printed its very first paper for distribution to the general population, to February 15, 1889. The addition of this new content completes our collection of newspapers for this title. 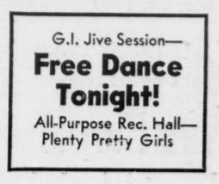 Polk County observer (Dallas and Monmouth, Or.) April 7, 1888, page 1. 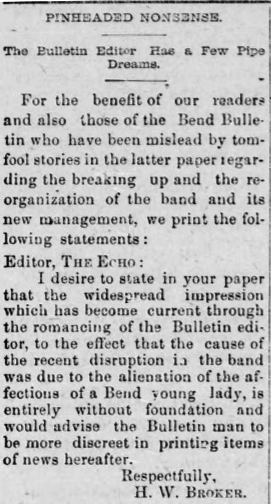 Polk County observer (Dallas and Monmouth, Or.) April 7, 1888, page 3. The Polk County Observer served all of Polk County and its main recipients resided in Monmouth, Dallas and Independence, Oregon. However, the newspaper covered international, national, statewide, and local news. International news covered by the Polk County Observer varied greatly. 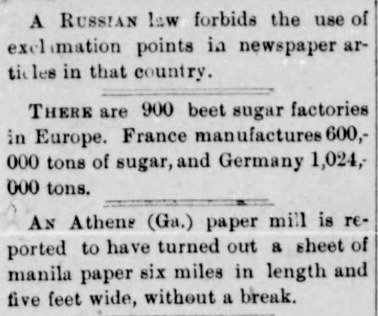 From an interesting law in Russia outlawing the use of exclamation points in newspapers, to news about beet sugar factories in Europe! National news covered by this newspaper was just as interesting. 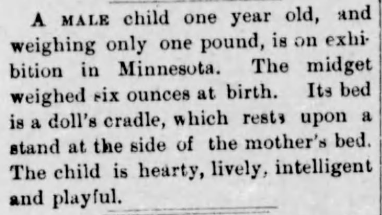 As evidenced in the snippet from the newspaper located to the left, which reports of a one pound, one year old baby living healthily in Minnesota. A child of such size living for so long during this time period is remarkable! Statewide news captured by the Polk County Observer was just as fascinating. 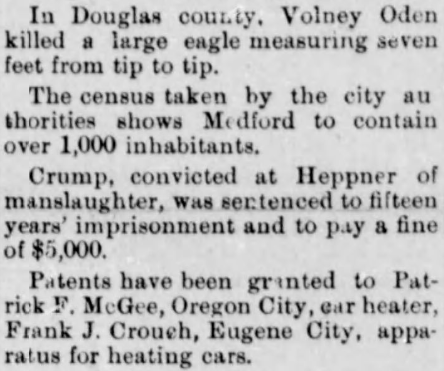 For example, there is a report of a man from Douglas County, Oregon who killed an eagle with a seven foot span! Located just a few lines down is an announcement that patents for a car heater and for an apparatus to heat cars were awarded to two Oregonian men. 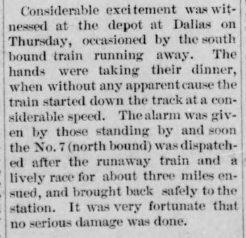 Finally, the local news reported by the Polk County Observer highlighted what life was like in the area, as well as any excitement that happened in the community, such as a runaway train. To learn more about Polk County and see more from Polk County Observer, please feel free to browse other issues from this title found on our website. Thanks to optical character recognition, this title along with all other titles located on our website, can easily be browsed or searched using keywords. In addition to this, all of our content can be downloaded as a PDF or JPEG and saved for future reference or research. Can you tell us a little about your publication and yourself? 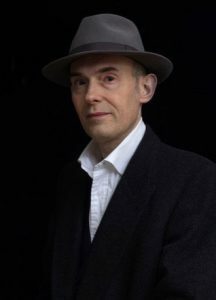 I’m a U.K.-based writer of nonfiction, most of which has focused on true stories set against a twentieth-century London backdrop. Probably the best-known of these in my home country was a book called Members Only, which has adapted into The Look of Love, a lavish and quite stylish movie starring Steve Coogan. My books are often described as “novelistic.” Without embellishing the verifiable facts of a story, I try to shape my research into a dramatic narrative that conveys a strong sense of place, character, and period. I suppose I’m instinctively drawn to tragi-comic stories, to stories that give us an insight into the wider society in which they took place. That’s certainly true of my latest book, King Con: The Bizarre Adventures of the Jazz Age’s Greatest Impostor—which is the first of my books to be published in the U.S.A. Spanning the period between 1917 and 1929, it’s about Edgar Laplante, a handsome and extraordinarily charismatic Rhode Island-born vaudeville singer and con-man, who was a bit like a cross between Jay Gatsby and Tom Ripley (with a dash of David Bowie’s blurred sexuality and shapeshifting theatricality). In search of attention and acclaim, Laplante reinvents himself as Chief White Elk, leader of the Cherokee nation. He ends up traveling to Europe to meet the British king. While he’s there, he captivates a pair of fabulously rich Austrian countesses who bankroll his “royal tour” of fascist Italy, where he becomes a darling of Mussolini’s regime, routinely greeted by thousands of adoring fans. But this isn’t a straightforward con-trick story. Over just a few months, Laplante gives away his ill-gotten-gains—equivalent to as much as $58 million in 2018 currency! Absolutely everything—the period; the intriguing and very strange personality of the man at the center of it; the various settings, which range from First World War-era America to 1920s Paris and the French Riviera. Immediately I came across the Edgar Laplante saga, I knew I had the ingredients of a book that’d generate a good advance from a U.S. publisher and that would, more to the point, be fun to research and write. Edgar Laplante’s often absurd antics certainly kept me entertained. At that time I was keen to find a specifically American story and use that as a means to switch to a U.S. publisher, partly because your country has a stronger tradition of novelistic nonfiction, and partly because I love American books. Not just the contents, but the way they’re designed and produced. To me, they always feel far superior to their British counterparts. One of the lovely things about writing nonfiction is that you learn so much when you’re working on it. As with my previous books, I’ve gone to great lengths to comprehend the world within which my protagonist pulled his various cons. Understanding the nature of communications between cities at that time was key to understanding how an impostor like him could keep conning people and then just moving on to another city. I drew on a vast amount of material that generated about half-a-million words of notes. The central thread of the story relied upon old files from Scotland Yard and the Bureau of Investigation (the precursor of the F.B.I. ); letters held at Washington State University; a smattering of obscure memoirs; along with a staggering number of newspaper and magazine stories published in America, Canada, Belgium, France, Italy, Switzerland, and the U.K. I was pleasantly surprised at how these enabled me to put together such a detailed portrait of the life of someone so transient. Getting back to your original questions, your digital archive renders the research process much, much easier than it used to be. Paradoxically, this sort of digital technology makes it possible for writers like me to evoke the pre-digital world. For instance, I routinely use word-searches in order to obtain information about such things as weather, specific streets, and sartorial fashions. The only trouble is, such textural detail tend to lead misguided readers to assume I’m fictionalising the past. Where can we purchase/access your book? It’ll be available through Barnes & Noble and independent bookshops, as well as websites such as Amazon and Indiebound. What’s your next project? I’ve just put together a proposal for a new book, though I haven’t yet shown it to either my U.S. or British agents. It’s for what could be described as a nonfiction thriller—a label that is, I know, frequently applied to books that are less than thrilling. Well, I hope this’ll buck the trend. 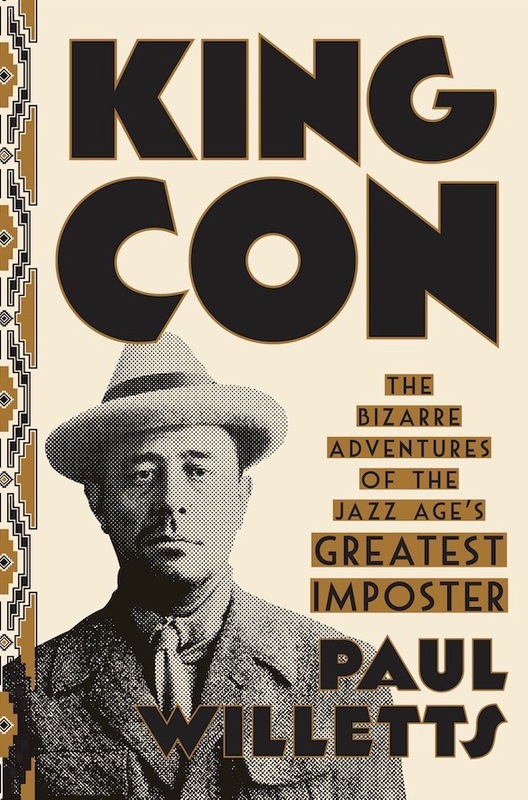 Like King Con, it focuses on a bizarre and dramatic story that hasn’t, astonishingly, generated masses of previous books. For more information about Paul and his work, visit www.paulwilletts.com. John Riha, Ashland-based author, discusses the historically-rooted inspiration for his latest novel! 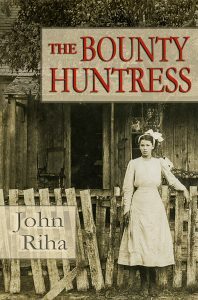 The Bounty Huntress is an historical novel set in southern Oregon in the early part of the 20th century. It tells the fictionalized story of Iris Greenlee, Oregon’s first female bounty hunter. Iris is a young farm girl from the Applegate Valley whose father—a game warden in Jackson County—is murdered when she is very young. She grows up tough and rough-hewn, and learns many practical survival skills, including hunting deer in the nearby mountains. When she and her small family—her widowed mother and autistic brother—are nearly overwhelmed with setbacks, indignities, and the threat of the loss of the family farm, Iris is determined to make money by using her backwoods knowledge: She’ll hunt wanted criminals for money. I’m a longtime media executive from the Midwest with a professional history that includes writing and editing for many national publications. I was the Executive Editor of Better Homes and Gardens and the Editorial Director for Meredith Corporation’s Special Interest Media, a group of more than 120 magazines and seven websites. After raising our two boys in Iowa, my wife and I decided to move back to the West, to Ashland, where we had met in 1984. 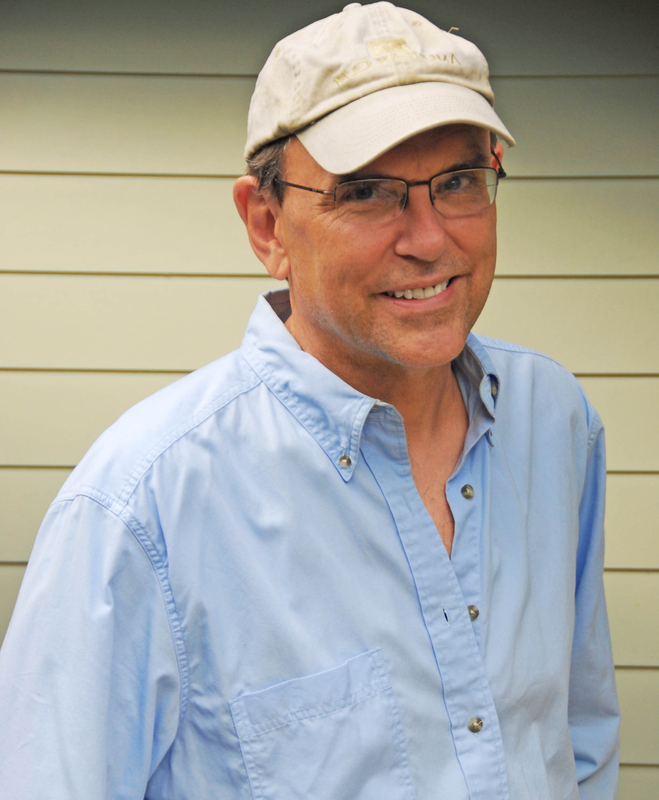 I now freelance write and edit for national magazines and websites, and I’m slowly turning my career toward writing books, especially historical fiction and humor. The part of the story about the murdered game warden is true. I ran across one of those “100 Years Ago Today” articles in the Medford Mail Tribune about the crime, and I became intrigued. I was especially interested in the fact that the murderer was acquitted in a raucous trial, even though there was a reliable eyewitness to the crime. Also of interest was the fact that the warden had two small children at the time of his death—a four-year-old girl and two-year-old boy. Add to that the fact that the accused murderer himself was murdered 16 years later in an unsolved crime. I began to wonder, “What if those kids grew up and took their revenge?” That classic revenge theme was the genesis for the novel. The part about Iris Greenlee becoming a bounty huntress is fiction. The archives available through Historic Oregon Newspapers online were invaluable. In researching the murder, I was able to follow the crime from the shooting all the way through the trial in great detail. Many small observations and nuances noted in the historical articles were a great help in adding color and authenticity to the novel. I was able to corroborate facts in other local newspaper accounts and the Oregonian. Other period articles and even advertisements were extremely valuable in setting the tone and creating language appropriate to the period. I also spent many hours at the Southern Oregon Historical Society Library in Medford, researching details such as the construction and floor plans of the county jail and courthouse in Jacksonville, and viewing historic photos depicting the towns and rural locations of Jackson County. The Bounty Huntress is available through Amazon and any book store can order copies. Locally, it’s at Bloomsbury Books in Ashland, rebel heart books in Jacksonville, and Reader’s Guide Books in Salem. Travelling along the coast last year we stopped at the Coast Guard Lifeboat Station in Port Orford. Although it’s decommissioned now, they had an extremely treacherous and dramatic launch point for rescue operations in the 1930s. That definitely got me thinking, so we’ll see if that manifests into another book.